Are your electronics holding you back? - Electronics are great, but too many will end up hurting you. Photo by Karen Ryan. At the Melges 24 European Season Opener in Proto Roz, I invited multiple World Champion and Italian legend Flavio Favini to sail with me. On the first day, the wind never really filled in enough to race, so we used the time to catch up and bounce ideas off each other. One topic we talked about: electronics. Favini and I talked about the merits, problems, and availability of having electronics on a smaller boat. 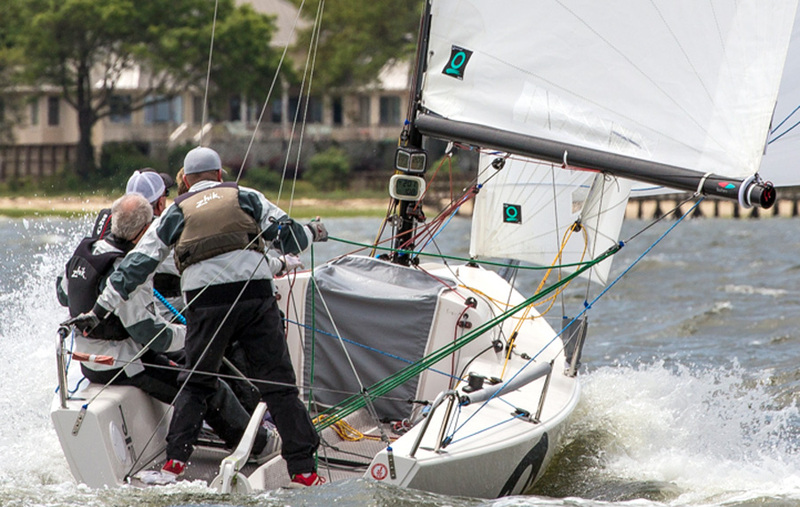 Due to the drop in complexity and price over the last decade, we’ve seen an influx of electronic instruments on smaller (less than 32 feet) racing sailboats. We now even see Melges 20s with dual B&G displays, plus GPS units, such as a Velocitek. The displayed information includes boat speed, heading, heel, SOG (speed over ground), and more. That is a lot of information for a 20-foot boat! As helpful as that information could be, however, electronics may not always be the best option. As Favini and I talked, we realized we share similar opinions. Here are our main thoughts about electronics on small boats. The amount of time I’ve spent messing around with badly functioning electronics outweighs the moments when they’ve truly been an asset during racing. So many things can go wrong: dead batteries, corrosion, lost offsets, crazy wind shear – the list goes on, and the frustration level rises. Target speeds have made their way down to smaller boats, but they provide trimmers, helmsman, and all of the team with a wrong sense of security (if you are easily hitting them) or insecurity (if you aren’t getting to a given target speed). Personally, I barely glimpse at them. My target speeds for a given day all originate from the tuning I do before racing starts, which makes it really important to get on the race course early! I dedicate a good portion of my time to figuring out the actual sailing conditions (wave state starboard/port), variance in the wind direction and velocity, and tuning with a good, reliable, fast partner. If you do have a trustworthy speedo, you can obviously consult your notes to see what speeds you were working with in similar conditions. But a slight change in sea state or wind shear can change the way you need to sail the boat at its fullest potential. Use the target speeds only as a crude reference, but rely on your pre-start tuning and notes to truly hone in on what speeds you should be achieving for the given conditions. How do the sails look and react to pressure changes? They have a finely-tuned inner 6-axis gyroscope telling them how the boat is moving through the water. They also rely on feedback from the crew. Calling relative boat speed to the boat to windward allows changing modes as necessary. This is especially important coming off of the starting line. Electronics dull your instincts because sailors start depending on them more than on their inner 6-axis gyroscope. It also diminishes situational awareness as focus shifts to numbers instead to the next set of waves and wind patterns. The problem with electronics is that they are always late. Every bit of information you get is delayed, and your reaction to it is even later. In order to make a boat go fast you need to be pro-active, not reactive! Whenever I think about using electronics on a smaller ship, I picture Luke Skywalker battling the Deathstar. It wasn’t his high-tech equipment that helped destroy the Deathstar, it was the Force (his instincts), knowing his surroundings, and his abilities.